References: 1. FDA clears first contact lens with light-adaptive technology [news release]. Silver Spring, MD: US Food and Drug Administration; April 10, 2018. https://www.fda.gov/NewsEvents/Newsroom/PressAnnouncements/ucm604263.htm. Accessed October 16, 2018. 2. JJV Data on File 2018. ACUVUE OASYS Brand Contact Lenses with Transitions Light Intelligent Technology - Objective Clinical Claims. 3. JJV Data on File 2018. 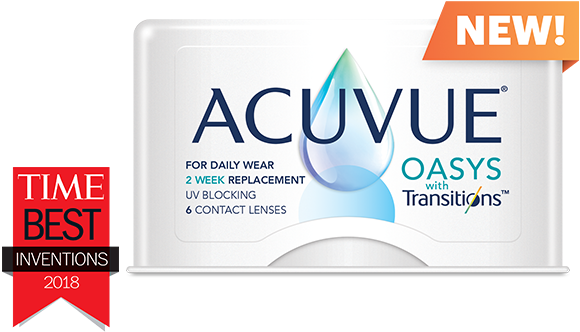 ACUVUE® OASYS with Transitions™ Light Intelligent Technology™. Helps protect against transmission of harmful UV radiation to the cornea and into the eye. WARNING: UV-absorbing contact lenses are NOT substitutes for protective UV-absorbing eyewear such as UV-absorbing goggles or sunglasses because they do not completely cover the eye and surrounding area. You should continue to use UV-absorbing eyewear as directed. NOTE: Long-term exposure to UV radiation is one of the risk factors associated with cataracts. Exposure is based on a number of factors such as environmental conditions (altitude, geography, cloud cover) and personal factors (extent and nature of outdoor activities). UV-blocking contact lenses help provide protection against harmful UV radiation. However, clinical studies have not been done to demonstrate that wearing UV-blocking contact lenses reduces the risk of developing cataracts or other eye disorders. We have successfully received your information! You are now registered to get exclusive information about ACUVUE® OASYS with Transitions™ Light Intelligent Technology™. Learn more about how this first-of-a-kind contact lens works below. †Helps protect against transmission of harmful UV radiation to the cornea and into the eye. WARNING: UV-absorbing contact lenses are NOT substitutes for protective UV-absorbing eyewear such as UV-absorbing goggles or sunglasses because they do not completely cover the eye and surrounding area. You should continue to use UV-absorbing eyewear as directed. NOTE: Long-term exposure to UV radiation is 1 of the risk factors associated with cataracts. Exposure is based on a number of factors such as environmental conditions (altitude, geography, cloud cover) and personal factors (extent and nature of outdoor activities). UV-blocking contact lenses help provide protection against harmful UV radiation. However, clinical studies have not demonstrated that wearing UV-blocking contact lenses reduces the risk of developing cataracts or other eye disorders. References: 1. JJV Data on File 2018. ACUVUE® OASYS with Transitions™ Light Intelligent Technology™. 2. American Academy of Ophthalmology. What is photokeratitis—including snow blindness? https://www.aao.org/eye-health/diseases/photokeratitis-snow-blindness. Published September 1, 2017. Accessed October 9, 2018. 3. American Optometric Association. UV protection. https://www.aoa.org/patients-and-public/caring-for-your-vision/uv-protec.... Accessed October 9, 2018. 4. Walls HL, Walls KL, Benke G. Eye disease resulting from increased use of fluorescent lighting as a climate change mitigation strategy. Am J Public Health. 2011;101(12):2222-2225.